Seven people suffered injuries after riot police clashed with anti-fascists at a neo-Nazi rally in Stockholm. Police say four law enforcement officers needed treatment, along with three civilians. 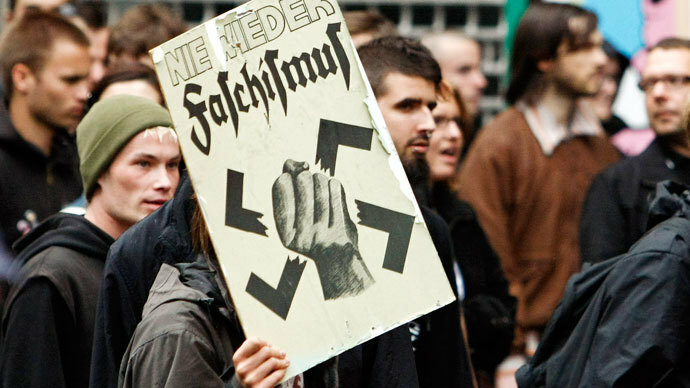 The march was organized by the Party of Swedes, a far-right organization, and attracted around 150 members. They were far outnumbered by those protesting against the gathering, with thousands gathering in the city center. The vast majority of protesters were well-behaved, but a minority attacked the police with firecrackers, bottles, eggs and panels from a security fence. "We have had violent riots with people throwing objects at police," police spokesman Lars Bystrom said, according to AP. He also mentioned that two arrests were made, one for “preparation of aggravated assault,” and another for climbing onto the roof of the Royal Opera House, where the neo-Nazi group started and ended their march. 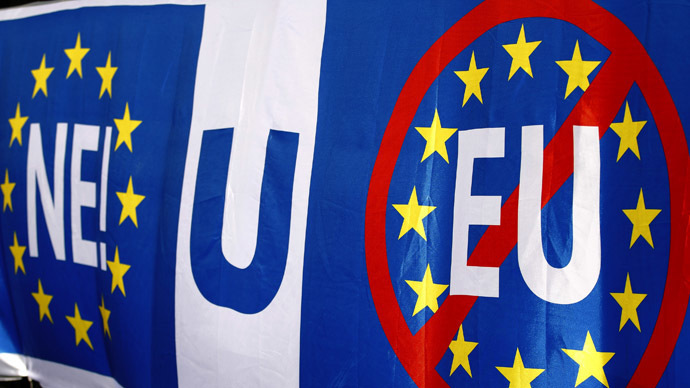 The rally took place with Swedish parliamentary elections set to take place in two weeks. 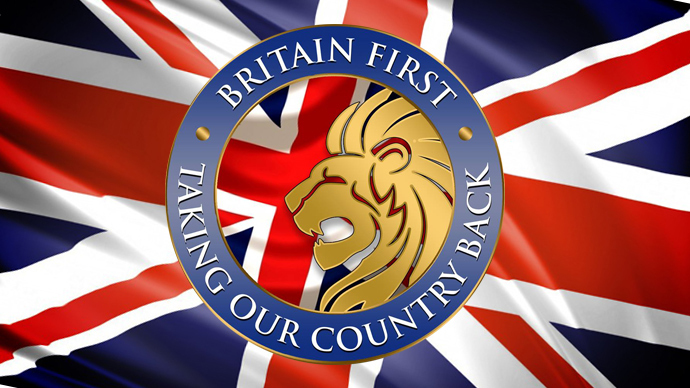 Just last week, on August 23, violence broke out at another march held by the Party of Swedes in Malmo, which has a high immigrant population with 31 percent of the city’s residents having been born abroad, according to the city’s official website. The trouble started after anti-fascists tried to block the neo-Nazi march and clashed with the police ahead of a speech by Stefan Jacobsson, the leader of the Party of Swedes. Ten people were injured during the clashes, with many of the demonstrators critical of the heavy-handed tactics used by the police, which included a charge by officers mounted on horseback at the participants. “I am shocked at the police’s excessive force,” Matilda Renkvist, one of the organizer of the demonstration, said. 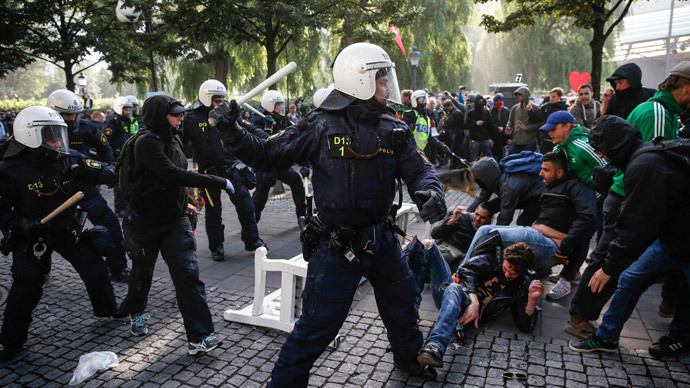 This is not the first time Malmö has witnessed disturbing scenes of violence during protests. In March 2013, a standoff between anti-racist demonstrators and anti-Muslim group the Swedish Defense League (SDL) was similarly dispersed by police using horses, dogs and helicopters. The Party of Swedes is campaigning on an anti-immigration ticket. Their program says they want to stop immigration and keep Swedish citizenship for people with “Western genetic and cultural heritage,” AP reports. Formerly known as the National Socialist Front, they managed to win one local council seat in a small town in central Sweden in 2010. However, the Party of Swedes do not enjoy widespread support and with elections in a fortnight, they are not expected to gain nearly enough support to enter the national parliament. However, one party which is expected to challenge the two leading parties, the Social Democrats and the Moderate Party, is the nationalist Swedish Democrats, who have enjoyed a surge in support over their anti-immigration policy. The country expects more than 80,000 asylum seekers this year, with a large portion coming from Syria. There was a 70 percent jump in applications in the first six months of 2014, with such a rise not seen since the Yugoslav Civil War in the early 1990s, according to the Swedish Migration Board. According to the UN High Commissioner for Refugees, Sweden received the most asylum applications per person in the world from 2009 to 2013. The share of Swedes born abroad was 15.9 percent last year, compared with 11.3 percent in 2000. Immigration rose 12 percent to an all-time high last year.